Vietnam’s Minister of Agriculture and Rural Development Nguyen Xuan Cuong and Laos’ Minister for Agriculture and Forestry Liane Thykeo co-chaired the annual event on bilateral agro-forestry-fisheries ties. Under the agreement, the two countries will focus on cooperating in science-technology and human resources training. 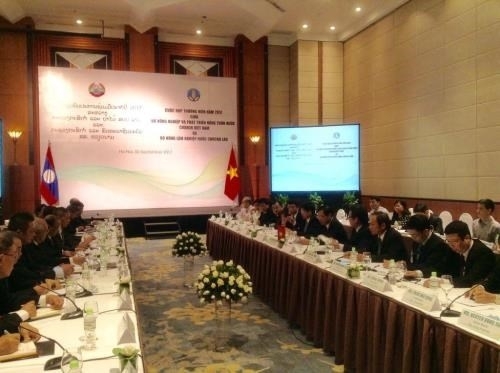 The two sides will also increase trade promotion of Vietnamese and Lao agro-forestry products. They agreed to promote investment, production and processing cooperation programmes in agriculture and forestry while removing difficulties for Vietnamese firms to expand investment in manufacturing activities in Laos. Minister Cuong particularly underlined a joint programme on cattle breeding development, which he said is important to both Vietnam and Laos, and expected to be a breakthrough in agricultural development. At the meeting, the two ministers also reviewed the implementation of the agreement signed between Vietnamese and Lao governments in agriculture and rural development in 2016-2017. In the period, the two countries actively coordinated to carry out projects using non-refundable aid of the Vietnamese government for the Lao counterpart. Specifically, an agricultural technical service centre in the north-eastern province of Xiangkhouang, built with total investment of 35.6 billion VND (1.5 million USD), was put into operation in December 2016. The construction of a similar centre in the Laos’ eastern province of Houaphanh was launched in February 2017. The two sides also held regular visits by high-level delegations, experts and technicians to share experience in agriculture, forestry, water resources, agricultural encouragement, and food safety. The Vietnamese ministry pledged to support Laos to develop rural areas and diversify goods production, as the Lao side said the country is concentrating on developing production of agro-forestry-fishery products and building new rural areas.